Adorn your indoor or outdoor wall with exotic shapes using the Gardman Moorish Mirror Wall Art. This intricate and hardy adornment combines soft curves with bold angles, for a remarkable accent on your wall. Its 22", square frame forms a generous focal point, with a 5" diameter mirror in the center for added dimension. This central mirror aids in dividing the unit into four sections, each sporting tendril and leaf shapes springing from a trumpet flower form. The steel body ensures a durable adornment, suited for display either indoors or outside, while the aged metal finish has brown, verdigris, and soft red tones to match a wealth of settings. Loops at the top two corners of the unit allow you to attach it to your wall using screws (not included). 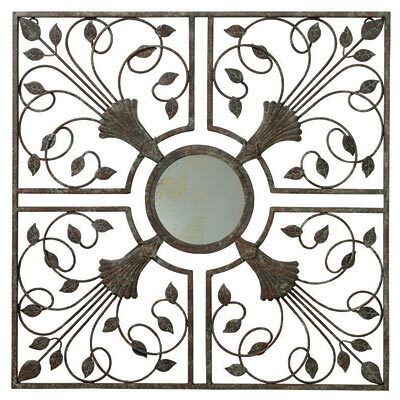 Enhance your garden or home with striking pattern and shape using this Moorish Mirror Wall Art.